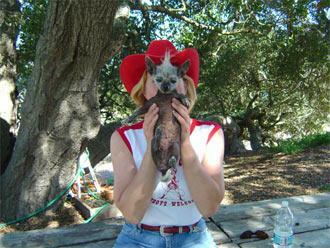 Susie Lockheed is the former owner and best friend of Sam, three-time undefeated champion of the World's Ugliest Dog Contest held each year at the Sonoma-Marin County Fair in California. Learn more about Sam, the competition, and how you can enter your own homely pet. Susie, thank you for sharing your time with us here at LoveToKnow Dogs. Obviously Sam, aka The World's Ugliest Dog, had garnered worldwide attention these last few years, and we'd like to express our sympathy for your loss of him this past autumn. So much of the attention has been focused on his looks, but this is more truly a rescue dog success story about an animal that perhaps no one ever thought would be adopted at the ripe old age of eight. LoveToKnow (LTK): Please share with us how you first met Sam. What was he like, and what made you decide to bring him home? Susie: I used to see SAM being walked about town by his first owner. She had bred SAM and his mother and owned SAM's grandmother. SAM wouldn't give me the time of day in those days. I always stopped to say hello, but he just wanted to get on with his walk. He wasn't very friendly at all, but I found his looks quite appealing as I already owned a few rescue hairless dogs. LTK: Do you know how Sam came to the rescue program in the first place? Susie: The former owner lost her longtime, "dog-friendly" place to rent and was desperate to find another pet friendly place. That proved impossible, and eventually she moved into a place where she had to sneak SAM in. The landlord found out and said SAM was forbidden. She then had him living in her car for quite a while because the shelters said with his looks, age and personality, he would be very impossible to place. She was loathe to put him in the shelters. She eventually tracked me down and asked if I would take him in. I said yes…on a 48 hour approval contingency. SAM was in a dog crate and was literally like "Cujo" of Stephen King fame, really scared and snarly. I would shove the food and water in and run for my life! He behaved like this for more than 48 hours, but he had already won my heart with his desperate plight. I decided to keep him, thinking this old guy won't last too long. Little did I know he would last another six or seven years and completely change my life! LTK: What made Sam lovable to you? LTK: Tell us about his personality, please. Susie: SAM had an extraordinarily cranky side, even to me, if I touched his leg. His leg was OFF LIMITS!! That is where his imaginary friend lived. Whenever you gave SAM a treat, he would keep checking his back leg (which kept getting closer and closer to the treat) and then he would attack! He would spin in circles like a whirling dervish making sure that the "friend" in his leg would NOT get his treat! All you had to do to get a photo of SAM, like the famous ones, was to barely touch his leg. SAM was also the biggest drama queen, or king actually! One time he came running into the house SCREAMING and dragging his back leg. I was sure he had gotten out and been struck by a car. Horrified, I dropped what I was doing and chased after him as he ran through the house dragging his leg and screaming. Well, when I caught up to him, I found he had sat on a post-it note, and it had stuck to his rump. Once I removed the evil thing that was chasing him, he settled right down. I laughed SO hard! LTK: Had you ever been involved in breed rescue prior to Sam? If so, what were your experiences? Susie: Yes, I had several rescue hairless dogs when I met SAM and always kept them. I am allergic to hairy dogs, so it is such a joy to have dogs that I can pet and cuddle. I also took in some hairy dogs and fostered them until placing them in a great home. LTK: How did being the owner of the World's Ugliest Dog reigning champ change your life? Susie: Well, the most significant change would be that SAM brought my fiance to me! Also, I certainly had more than my 15 minutes of fame with SAM. I have been seen all over the world in photographs and on TV, and I am still surprised when people recognize me. It was all SO much fun!! LTK: Would you share with us how you became involved with the World's Ugliest Dog Contest? Susie: My friends would tell me how hideous SAM was, and ask how I could stand to touch him. I always thought he was cute. One night I was watching Jay Leno, and he had on the winners of the World's Ugliest Dog Contest. I laughed until I cried over these adorable and funny misfits and instantly realized that none of them held a candle to SAM! I found out where the contest is held and in a few months, SAM and I were off to just north of San Francisco. The papers described SAM's first win as a landslide victory of mythic proportion. The rest is history. LTK: Describe the competition for us. What is judging like and are there different divisions? What does it take to enter? Susie: Any dog can enter. It is a rather small, old-fashioned county fair with the marvelous distinction of having this contest. There are two divisions; pure breed and mixed. The winners of those two categories then vie for the title of Ugliest Dog for that particular year. That winner then competes against former World's Ugliest Dog champions, known as the ring of champions. SAM died undefeated and had held the title for three years. LTK: Tell us a little bit about Tator Tot, Sam's significant other. You've entered her in the same competition, right? Susie: Tator Tot is my little angel. I have had her since she was just a few weeks old. She was the product of a "mistake" breeding, and friends saw her and brought her to me for my 40th birthday. She is now 14 and going strong. Although I think she is the world's cutest dog, she has twice won the ugliest mixed breed category but never gone on to be Ugliest Dog of the Year nor World's Ugliest Dog. LTK: Honestly, is she really ugly enough to be a serious contender, because we all think she's kind of adorable. Unusual, but adorable. Susie: I concur. Tator is just TOOOO cute!!! I only entered her because she went along as company for SAM. LTK: What's happening with PeeWee, aka Son-of-Sam? Do you think his ugly dog career holds as much promise as Sam's? Susie: PeeWee Martini, aka "Son-of-SAM", lives somewhere back East. His owner e-mailed me and said she loved SAM and realized the value of the less than gorgeous dogs. She saw PeeWee in a glass cage at an obscure pet store and, in SAM's honor, knew she had to take him home. I know I would have done the same thing! I think PeeWee could have quite a career!! LTK: So, do you think you'll continue to be involved in the ugly dog hobby? I know that sounds kind of horrible, but I'm not sure what else to call it. Susie: Yes! I am hoping to become a judge one year. That is what I would like. It is a fun time. LTK: How are things going at your website these days? At one point, your site had the most hits on the web. That has to be a fairly awesome feeling to know that with so much available on the net, people wanted to know more about Sam most of all. Susie: By popular demand, I am keeping SAM's website open. It is a great way to link to his blog and see the photo gallery. SAM still gets many visitors and e-mail. LTK: You've also developed some Sam memorabilia that has become quite popular. Go ahead and give your merchandise a plug. Susie: Yes, SAM memorabilia is still selling. We have SAM T-shirts, mugs, calendars and magnets at samugliestdog.com. Part of the proceeds have gone to doggie related charities as well as helping me with my other dogs. LTK: So is there anything you would like to add that hasn't been asked? Susie: Some people have criticized the notion of an ugly dog contest. I want them to know how much laughter and joy SAM spread throughout the world. He was an ambassador of the underdog and showed what devoted pets they could be as well. I have never had a dog as in love nor as appreciative as SAMMIE. And how else could a dog with SAM's mug ever get to ride in limos, be on TV, or have the room service captain at the Beverly Wilshire ask "and how would SAM like his fillet cooked this evening?" SAMMIE, I miss you!! Susie, thanks again for taking the time to talk with us. I'm sure our readers will enjoy this interview as much as I have. Best of luck in all your ventures, and long live the memory of Sam! Flash!- Tator Tot placed third in the 2006 Ugly Dog Contest. A respectful showing, considering the field, but we thought she was way to cute to be called ugly any way!